Heat kadai, dry roast the moong dhal until nice aroma comes. Add to the pressure cook with milk , cardamom powder & water. Cook upto 1-2 whistle & cool it down . Add jaggery & allow to boil until all mixs togather. heat ghee in a pan, add cashew nuts & fry until golden brown. Add to payasam & Serve hot or cold. எங்கள் வீட்டில் அனைவரின் Favorite payasam.. 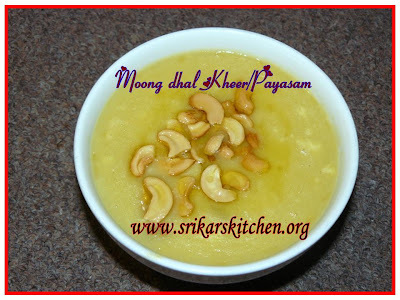 Delicious payasam.. If you wish you can send this to my FIL-MILK event. Check my blog for details dear! I just love this moongdal kheer, beautiful with all those nuts. hmm!wouldn't mind some here too!vellam payasams are my alltime mood boosters. Please collect a gift from my blog!!! i love this payasam soo much..nicly presented..